I’ve checked my calendar as many times as I possibly can and I’m pretty sure we have 3 months to go before April hits. The other possible explanation is that we are the alternate reality, because I can’t figure out the real reason between AMD and Intel working together on anything. In fact, the real reality must be the one where they are still bitter rivals and we exist outside of that. On the flip side, Intel is using Vega graphics in their latest release and this is really great news. Intel’s new 8th gen processors, geared towards mobility, are adding the Vega graphics core with HBM2 memory. The huge benefit from this is saving space and power consumption, all while increasing computing and gaming performance. However, there’s another big reason why this is such big news. Nvidia may dominate the GPU market, but something that’s easy to forget is how many gamers use integrated graphics to play titles on a laptop. This could begin changing how AMD performs in gaming since developers may begin taking the Red side of things a lot more seriously. Forums have stated that AMD could perform much better based on their hardware level, but poor optimization hurts that. If Vega starts taking large market shares as an integrated graphic product, we may see a lot more attention given to AMD when games are developed. This merger is great news for a competitive market, but only time will tell on if we see some significant performance improvements as a result. Sure, Intel is getting a major boost on the mobile performance because that’s what this platform is designed for. On the other hand, if AMD hardware is just that inferior to Nvidia’s, then no amount of driver and development optimization will change that. My personal opinion is that we’ll see some reasonable increases in AMD’s future performance with new game titles, maybe even as much as 15%, but Nvidia isn’t losing their performance crown anytime soon. Check out the full details from Intel’s press release below! 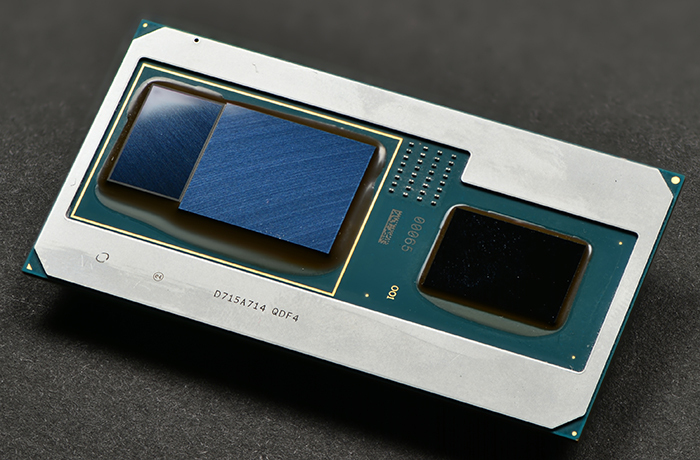 Today, Intel is launching a first-of-its kind processor: the 8th Gen Intel® Core™ processor with Radeon™ RX Vega M Graphics. Packed with features and performance crafted for gamers, content creators and fans of virtual and mixed reality, it expands Intel’s portfolio thanks to its optimization for small form factors like 2 in 1s, thin and light notebooks, and mini PCs. Intel first shared initial details about this new addition to the 8th Gen Intel Core processor family in early November. It brings together the Intel quad-core CPU, Radeon RX™ Vega M graphics and 4GB of dedicated HBM2 using Intel’s Embedded Multi-Die Interconnect Bridge (EMIB) technology. EMIB acts as a high-speed intelligent information bridge between the GPU and HBM2 and reduces the usual silicon footprint to less than half that of discrete components implemented separately. The new 8th Gen Intel Core processor with Radeon™ RX Vega M graphics delivers a top-of-the-line experience to gamers and VR enthusiasts. This includes up to three times2,5,6 the frames per second on thinner, lighter and smaller devices compared with similar systems from three years ago and up to 40 percent3,5,6 compared with current discrete graphics. Now, gamers can play the latest titles like “Vermintide* 2” in high resolution on the go or in their living room with smooth motion and vivid colors, all as part of a truly immersive gaming experience. Content creators can also do more with this new processor, whether it’s creating 3D images from scratch, editing videos seamlessly at home or on the go, or using the most popular creative applications. Compared with a 3-year-old PC with discrete graphics, content creation with Adobe Premier Pro* is 42 percent faster.4,5,6 Imagine the combined flexibility and performance enabled with this new processor for content creators in the growing 2 in 1 form factors for PCs. In addition to the Intel NUC and new Dell and HP devices, this new 8th Gen Intel Core processor will enable a gaming cloud solution brought on by Artesyn* and Gamestream*. But this is only the start of what’s coming with the 8th Gen Intel Core product portfolio this year. Expect to see more from Intel on the high-end performance notebook segment, the Intel Core H-series, Intel® Optane™ memory coming to 8th Gen Intel Core mobile devices for the first time and more details on 8th Gen Intel® Core™ vPro™ platform for businesses. A variety of new 8th Gen Intel Core devices will be on display at Intel’s CES booth, #100048 in Central Hall South at the Las Vegas Convention Center. To stay up to speed on all of the company’s CES news, visit the 2018 CES Press Kit and tune in to Intel CEO Brian Krzanich’s pre-show keynote, focused on how data is shaping innovation. Intel, the Intel logo, Intel Core, Intel Optane and Intel vPro are trademarks of Intel Corporation in the United States and/or other countries. 5Software and workloads used in performance tests may have been optimized for performance only on Intel® microprocessors. Performance tests, such as SYSmark and MobileMark, are measured using specific computer systems, components, software, operations and functions. Any change to any of those factors may cause the results to vary. You should consult other information and performance tests to assist you in fully evaluating your contemplated purchases, including the performance of that product when combined with other products. For more complete information, visit www.intel.com/benchmarks. 6Benchmark results were obtained prior to implementation of recent software patches and firmware updates intended to address exploits referred to as “Spectre” and “Meltdown.” Implementation of these updates may make these results inapplicable to your device or system.